As evidenced by the recent Route 66 festival in Germany, or international participation in the forthcoming Best of the West on 66 Festival in Kingman, Arizona, US 66 may be the most famous highway in America, even though it officially ceased to exist decades ago. However, in addition to being the nations longest attraction, it is also one of the most endangered. Evidence of this was contained in a recent message from Ron Hart of the Route 66 Chamber of Commerce that announced the demolition, without public hearing, of a bridge near Carthage, Missouri that was built in 1922. The bridges on Route 66 are an integral component in creating the sense of time travel that is a road trip on this old highway. They also one of its most endangered. Among the many things that make their demolition so maddening is the fact that there is a rather dramatic increase in bicycle tourism on Route 66, another opportunity for tourism related economic development. If it a state or county deems that isn’t cost efficient to renovate an historic bridge to accommodate highway traffic, shouldn’t their preservation be considered an investment if for no other reason than as a component in a bicycle corridor? Consider the debacle at Route 66 State Park in Missouri. 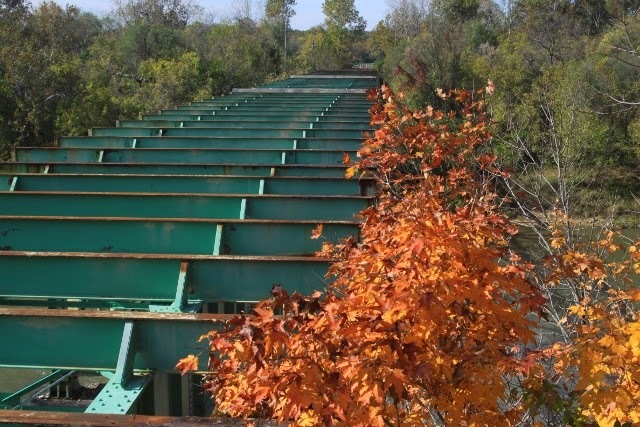 Removal of the road deck on the Meramec River Bridge stifled development of a bicycle corridor, and divided a state park that was a model for land reclamation. Resultant of the loss of this bridge, to visit both sides of the park requires a detour of almost twenty miles. Author Jim Ross recently published an astounding book that documents the bridges of Route 66 through stunning photographs, with concise history. This book graphically illustrates the importance of Route 66 bridges in preserving the roads scenic integrity. The loss of each bridge changes forever the idiosyncratic nature of the road. In October, my dearest friend and I will be heading east on our annual pilgrimage. Plans for photographing the architectural beauty of historic bridges against a backdrop of fall foliage will need to be adjusted on the drive through the Ozarks. adventure. This year it is my honor to announce that I will be making a presentation on Route 66 in the southwest on Friday evening at the Wagon Wheel Motel. This morning I received confirmation that Joe and the Road Crew will be performing at Belmont Winery on Saturday evening during the festival. 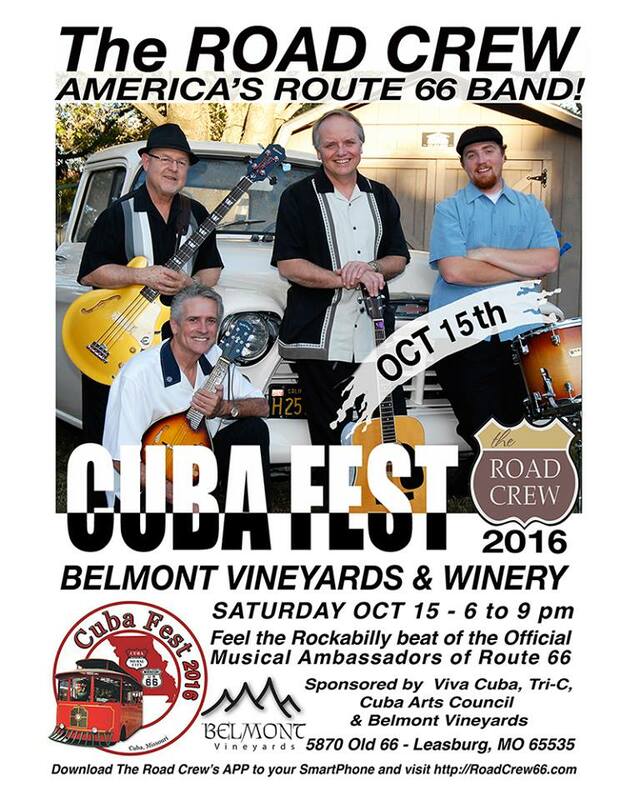 The winery (try the pink dogwood) and music by the road crew will ensure that this years Cuba Fest in Cuba, Missouri will be a most memorable event. To satisfy my curiosity, I throw this out as a topic of discussion. Does it seem like the number of travelers on Route 66 in September and October are increasing compared to previous years? I stay rather busy during the months of spring and summer meeting with travelers and groups, making presentations, and arranging for special events. However, last year, and the way the schedule is shaping up for this fall, the months of August, September, and October have me busier than a one legged man in a behind kicking contest. That is before I factor in the trip to Cuba Fest, the Missouri History Museum in St. Louis, the 2nd Annual Miles of Possibilities Conference in Bloomington, and the 90th anniversary Route 66 events in Los Angeles. So, what are your thoughts? Is Route 66, the great American road trip on the cusp of becoming a year round attraction? Okay, I now have a few sponsors lined up for the Jim Hinckley’s America fall tour – Grand Canyon Caverns, Simply Pre-Paid from T-Mobile (Kingman store), My Marketing Designs: Marketing Media Company, and Savon Bath Treats. Now, I am looking sponsors of a very busy 2017. If you would like to have your business showcased before an international audience, have I got a deal for you. With that, it’s time to wrap this up. See you on the road.